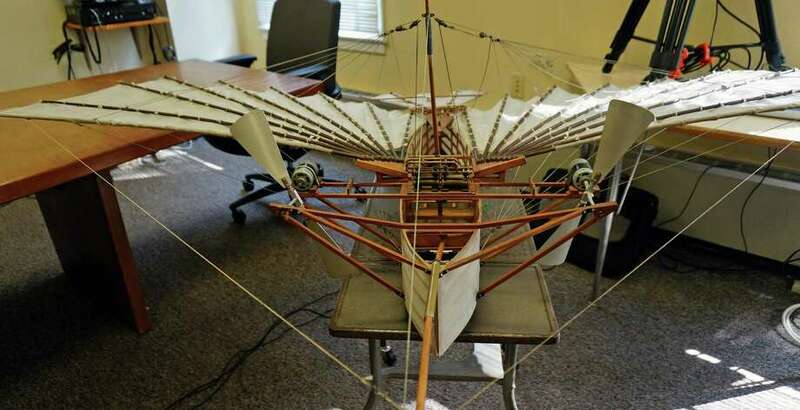 A scale replica of Gustave Whitehead's Condor 21 was on display at the Board of Selectmen meeting, but the full-sized replica can be viewed August 14 at the Sherman Green. The town hopes to create a series of markers here, as well as in Bridgeport and Stratford, to honor the exploits of aviation pioneer Gustave Whitehead and support the region's campaign to gain recognition for his "first in flight" claim rather than the Wright brothers in North Carolina. Whitehead, a German immigrant who lived in both Fairfield and Bridgeport, last year gained recognition from "Jane's All The World's Aircraft" as the first to fly a motorized airplane as opposed Orville and Wilbur Wright, who have been more widely credited as the first to fly a motor-powered aircraft at Kitty Hawk, N.C., in December 1903. But Whitehead advocates said that his airplane flight on Aug. 14, 1901 -- along the town's shoreline, ending at what is now Jennings Beach -- is the true first flight of a motorized aircraft. At Wednesday's Board of Selectmen meeting, First Selectman Michael Tetreau read a proclamation designating Thursday, Aug. 14, as "Gustave Whitehead Day" in Fairfield to mark the 113th anniversary. He also announced the creation of the First in Flight Advisory Committee. Andy Kosch, a retired Fairfield teacher who led a team that built a flew a replica of Whitehead's Condor 21, will head the committee. A full-sized replica of aviation pioneer Gustave Whitehead's Condor 21, believed by many in this area to have been the first manned flight of a motor-powered aircraft, will be on display Thursday, Aug. 14, from 10 a.m. until 6 p.m., on Sherman Green. The public is invited to view the replica of the original airplane, which was flown by Whitehead in Fairfield on that date 113 years earlier. For more information about Gustave Whitehead, visit www.gustave-whitehead.com. "The charge of the committee is to look at the best way for Fairfield to promote Gustave Whitehead," Tetreau said. He said the committee will work with Bridgeport and Stratford, where Whitehead also flew or lived. "It will be a Gustave Whitehead trail, a series of milestones or markers ... We're very excited about this," he said of the committee's plans. Kosch, who brought to the meeting a scale replica of the Condor, will be at Sherman Green on Aug. 14 with the full-size replica of the aircraft, from 10 a.m. to 6 p.m. The public is invited to come and view the plane at the green, corner of Post and Reef roads. "It had a 36-foot wingspan," Kosch said. "It was a very interesting craft." He said the committee will also investigate creating a suitable monument to Whitehead in town, perhaps at Jennings Beach. To further mark the anniversary of that first flight, Kosch said he plans to fly his ultralight plane "from Captain's Cove and Seaside Park (in Bridgeport), and over Jennings Beach," areas where he said the Condor was flown by Whitehead. Controversy over Whitehead's local legacy erupted earlier this year when an Alvin Street house where he once lived was slated for demolition. Despite a campaign by Whitehead supporters and aviation buffs to save the small home, which included several rallies in front of the house, the structure was razed in April. However, several artifacts from the house were saved to be incorporated into some kind of tribute to Whitehead.